(left) Simon Yam and (right) Eva Huang in The Man Behind the Courtyard House. The Skinny: Odd and unexpected, The Man Behind the Courtyard House fails as a horror film or other genre effort. However, its exploration of character, strange stylistic choices and valiant attempts to skirt SARFT make it worth a look. Starring Simon Yam as a hilariously cold but gradually sympathetic psycho. The Man Behind the Courtyard House disappoints and then defies its expectations. A looks-like-a-genre-film effort from director Fei Xing, Courtyard House stars Simon Yam as Chen Zhihui, a creepy dude watching over the remote courtyard house of the Huang family. Chen’s reasons for occupying the Huang house are initially unknown, but they’re quickly revealed after the house is visited by Huang family friend Xiaoli (Eva Huang) and her three buddies (one played by Yu Shaoqun of Forever Enthralled). The kids want to stay to attend a local cultural event, and they accept Chen’s hospitality even though his demeanor is far from inviting. Given his sinister countenance and the ominous bass thud that occurs whenever he appears, Chen is obviously bad business. Soon, Chen starts to pick off his young prey, usually with a well-placed nail to the back of their skulls, courtesy of his stellar carpentry skills and his victims’ stupidity. Ultimately, Xiaoli is the last one left, and she must face off against the increasingly psycho Chen while nursing a gimpy leg. Luckily, there’s a random power outage to equal the playing field. The first third of Courtyard House resembles a prototypical slasher that gets exponentially more generic with shock cuts, dumb characters and a directorial style that most resembles cheap-o nineties Hong Kong horror. Many twists are telegraphed far too early, and the exposition and China-safe plot twists also diminish matters. As Man Behind the Courtyard House gets moving, it only gets less interesting. Then the gears shift. The film goes Memento on its audience, moving back in time to the period right before Chen’s arrival at the Huang home, where he’s staying in a hotel along with machinery salesperson Zhou Dong (Chen Sicheng), who’s investigating the Huang family for reasons unrelated to Chen’s coming vengeance. In this segment, Chen is calculating but less creepy, his pronounced evil in the opening appearing here as a murkier menace. You know he’s after members of the Huang family, but will Dong or the hotel proprietors end up on his kill list? The film’s second segment provides those answers, before flashing back even further to follow Chen as he leaves prison and becomes embroiled in a potential crisis in a restaurant. With each jump back in time, the film offers more information about Chen while moving further from its supposed horror roots. Audiences seeking a slasher will only be partially satiated as Man Behind the Courtyard House exits that genre after only half-an-hour. Instead of checking out Yam’s murderousness, the film becomes about his psyche as we come to understand how he came to be a sinister killer with a deep bass entry track. As a horror film, Courtyard House is unsuccessful, but as a curious genre-bender and character study, the film is worthwhile. The constant shifts back in time eventually elucidate Chen’s character to the point that he becomes human and even sympathetic. 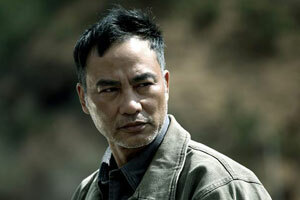 Simon Yam is one-note cold in the first segment, but in the flashbacks he shows layered emotion that helps explain his demeanor, and the character becomes more than just a bad guy out for blood. While not an obvious acting showcase, Courtyard House does give the celebrated B-actor and Milkyway Image player a platform to show his thespian skills.